One of the key points I’ve tried to stress on this blog is that micro-scale population structure – that is, fine genetic variation across populations can have a substantial impact on societal characteristics. 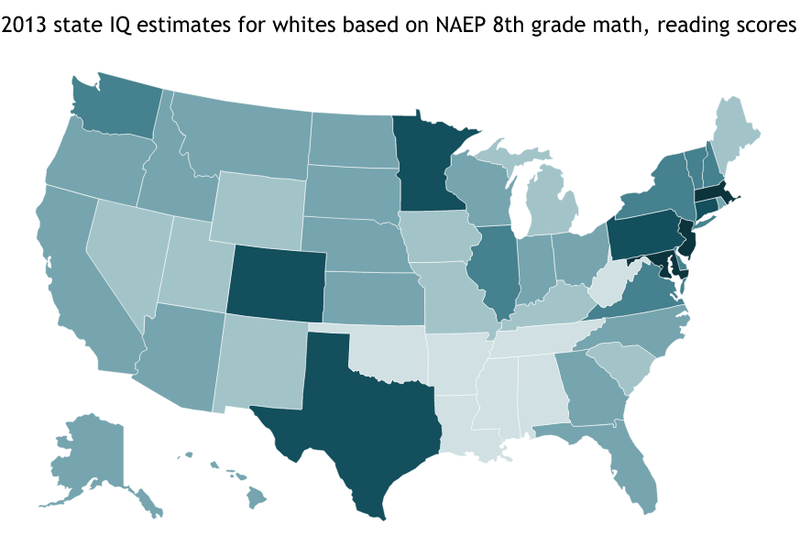 We aren’t just talking about continental racial variation. We aren’t even talking just about ethnic variation. Sorting within an ethnic groups can produce distinct regional differences. Founder effects are powerful, as is the converse effect, boiling off. …results from the genetic variation that exists within it (see my page American Nation Series for a review). While the founding colonial stock was the base for the subsequent differences that would take shape across North America, as argued by David Hackett Fisher and Colin Woodard (see Maps of the American Nations), it isn’t solely responsible for what we see today, because British Americans are not a majority even among White Americans. Subsequent immigrants have greatly altered the American landscape. These immigrants reshaped the nation in their image. Many of the differences across different parts of North America owes more to these immigrants than to the original settlers. Now a new study has made strides in tracking the legacy of these immigrants, and in so doing, laying the rest the matter of assimilation. 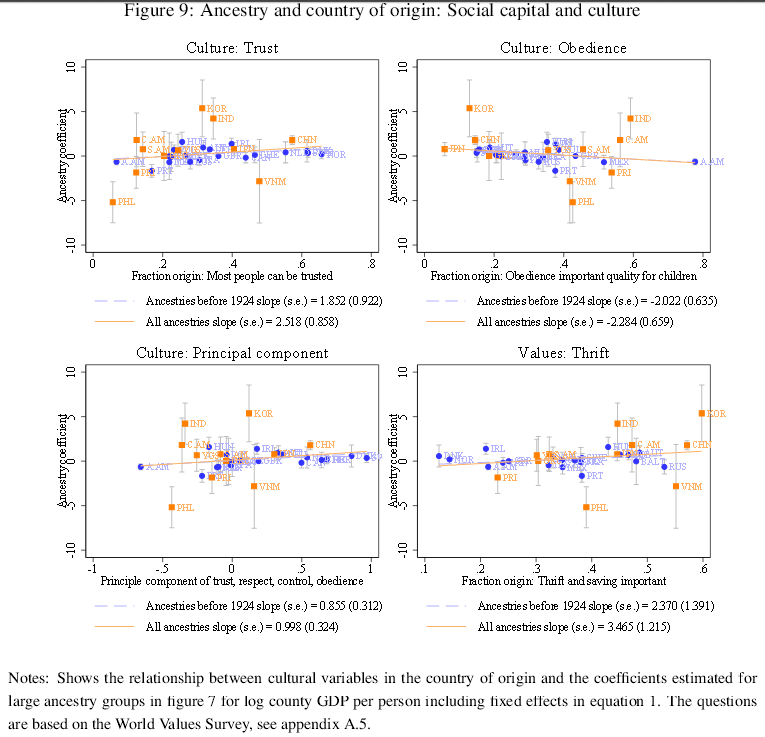 A key problem with tying socioeconomic outcomes to ethnic ancestry has been the difficulty of getting reliable measures of present-day ancestry (see Being the Dutch | West Hunter). Genomic data has helped somewhat, but isn’t yet fine-grained enough to examine matter very well (see More Maps of the American Nations). However, Fulford, Petkov, and Schiantarelli (2015) have come up with a novel way to solve this problem. We find that British Americans (who are “English” here; this category includes all with ancestry from Great Britain) remain the single largest group. These clearly show the positive relationship between immigrant characteristics and county level characteristics. One drawback of their analysis is that they compare everything against only their determined ancestry coefficient. We already that IQ is associated with all sorts of positive social outcomes. What may have been more useful is to compare these national characteristics with the same characteristics in each county. While many US counties probably lack the appropriate measures, it would have been a far more of a solid statement if they were able to do so. Every form of the estimation strongly rejects that ancestry does not matter. All estimates include county group fixed effects, so the fixed characteristics of the place of settlement is controlled for. 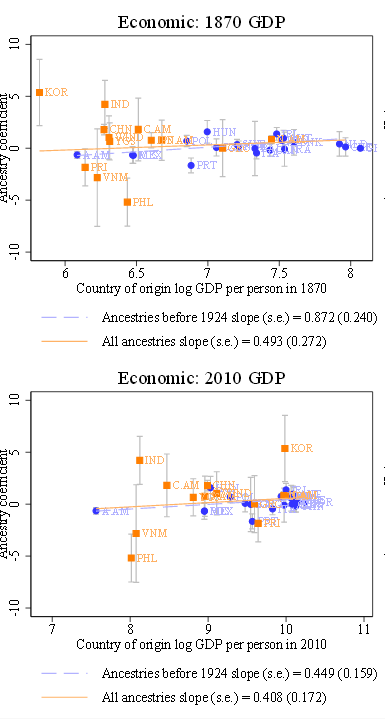 We can also ask whether regional trends—which might reflect evolving factors, such as industrial structure, that may be related both to county GDP and ancestry composition—may affect our answer. However, the inclusion of state specific period effects or county group specific trends, leaves the significance of the ancestry composition intact. 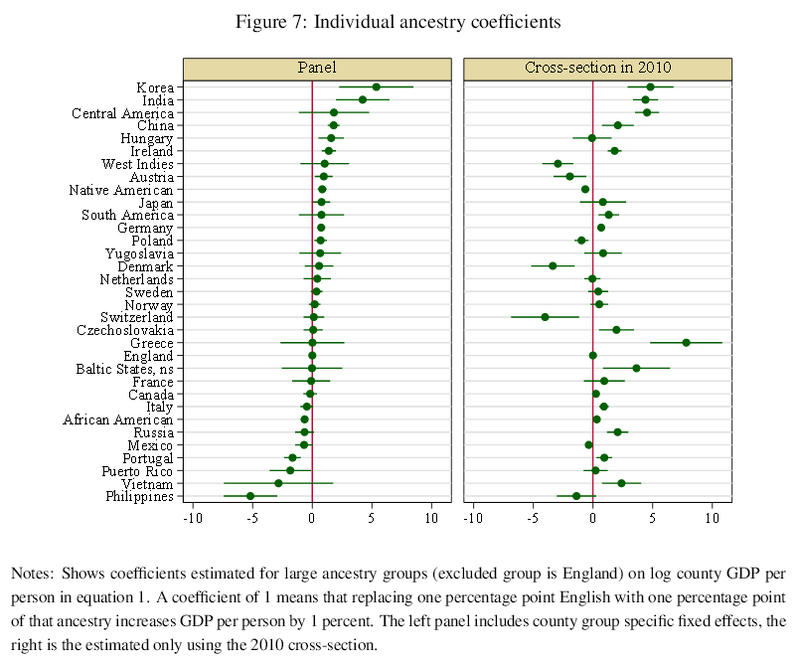 Our conclusion that ancestry matters are also robust to the adding county income in the previous period … as a regressor. 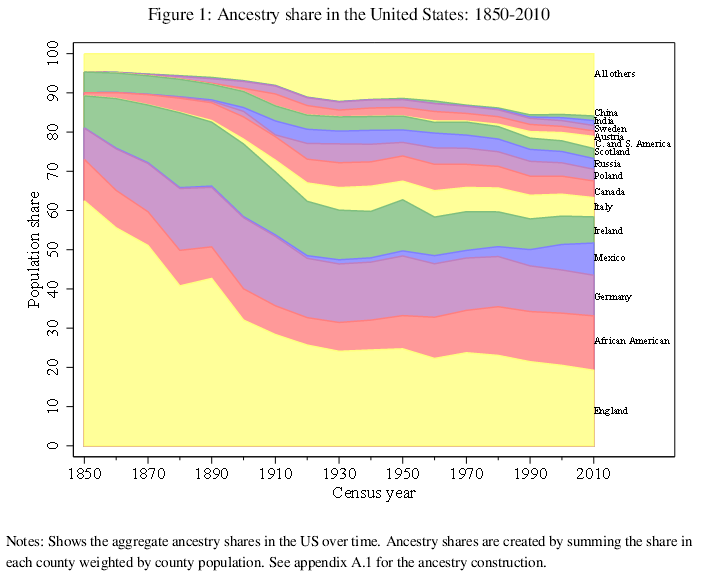 One might be concerned that ancestry matters only because it reacts to current shocks, yet ancestry matters even when we include it only at a decade lag. 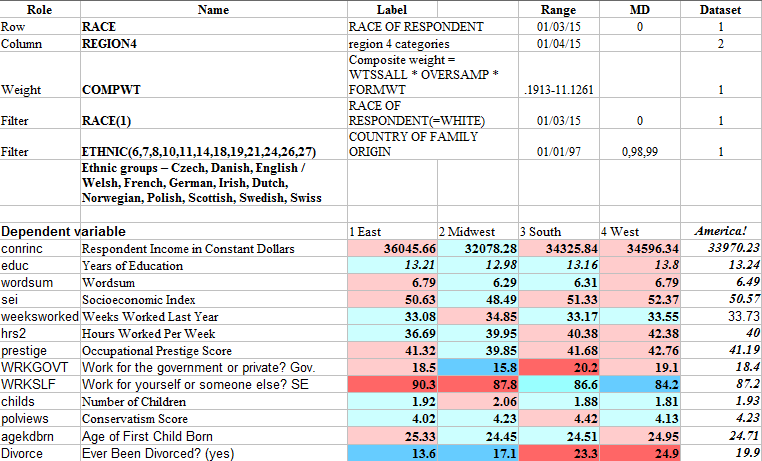 The last several columns include other possible explanatory variables including county level education, population density, and fractionalization constructed using our ancestry vector … All of these may be a result of ancestry, for example, if some groups put more emphasis on education than others. Similarly, an increase in density may reflect a higher level of urbanization of the county, resulting in a differential attraction for different immigrant groups. Ancestry continues to matters even after including these controls, and so ancestry matters beyond its relationship to education or urbanization. The evidence should show that even the rich regional flavor across North America has genetic roots. This also means that the persistent regional conflicts that trouble us here in America are in good measure intractable, as Colin Woodard discusses in a recent Politico piece. People move to regions suited to their own temperaments, serving to further solidify the regional distinctions. 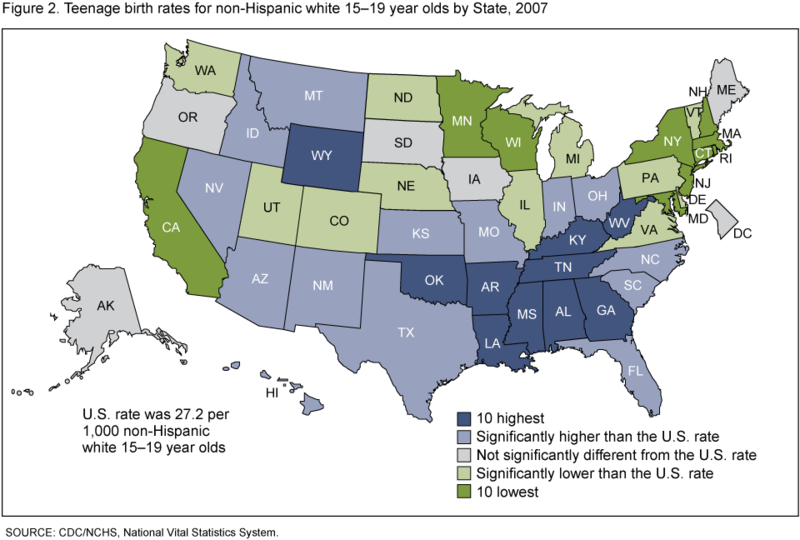 All these facts should makes clear how key demography is to societal outcomes. The people make the society. If you want a better society, you must (in one way or another) get better people. This has obvious consequences for immigration and for many other matters as well. Only time will tell if these facts come to be appreciated for what they are. So you proved America is on a downhill slide. Finish connecting the dots! Start campaigning for an end to the H 1 B Visa! As you know, much of what is known as conservative American culture is really Scotch-Irish culture. By conservative American, I mean gun-totin’, military joinin’, and church attendin’. The southern American nations (particularly the Deep South and Appalachia) and the Far West are strongly shaped by Scotch-Irish culture, but aspects of the culture are prevalent throughout the country, as embodied by country music and NASCAR. Even 4th of July celebrations are most celebrated in Scotch-Irish regions because of their patriotism. I know this may seem like an obvious question, but what explains the neocon and religious right conservatism of the Deep South versus the more Libertarian nature of the Far West? Is it simply the founding stock that left the south creating the current voting patterns of the Far West? Or are environmental factors at work? 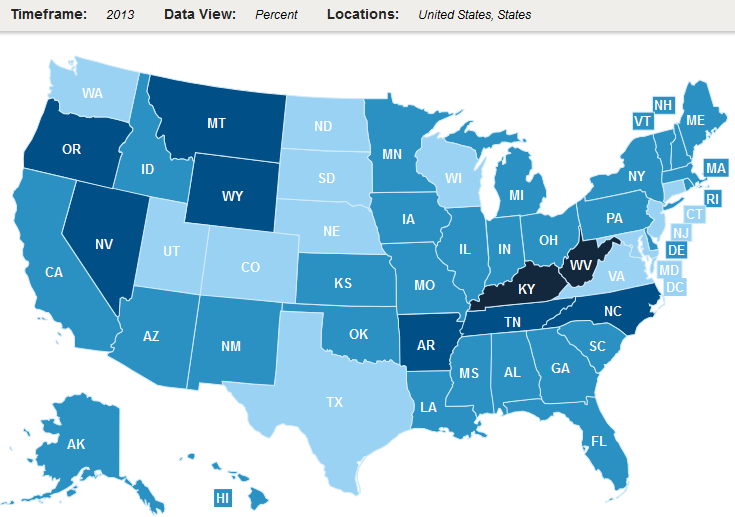 The libertarians out West are more accepting of vice, southerners resent those things. It’s kind of confusing to me. Second, the Scots-Irish are present in the Deep South, but they’re not the majority. Descendants of the English Cavaliers are. The Far West is an example of what you get with sorting. Individuals that went there were rugged individualists (you had to be in order to settle there). So they have a more libertarian view. Hell, they have legal prostitution (Nevada) and first gave women the right to vote. Oh yes, of course. Although I do believe Scotch-Irish form the majority in certain parts of the Deep South like the Gulf Coast, if I remember correctly. I just think it’s interesting, considering the South has some of the most collectivist American Nations, but the Far West is the most individualist Nation. A sub-population can create a very different culture when it moves to a new region. A sub-population can create a very different culture when it moves to a new region. If it’s a highly select fraction of the source population, yup. A lot of improvements of culture , seem to be really improvements of technology. But, it does seem cultural norms can hugely impact a culture, look at how when cultural technologies where imported to a place like south Korea, it exploded in wealth. I agree there is genetic variation across the USA that contributes , and largely to the pattern differences in values found across the usa. But if white southerners , en mass, got adopted at childhood by northerners, a lot of the particular values of the south, would disappear fast. I know the argument, in the HBD sphere is that culture is sort of like phenotypic personality of a group (race, sub population, what have you) writ large. But isn’t it odd how some cultural norms can change so fast. HOmsexuality has changed in value fast, its even changed in value amongst southern whites fast, way , way fewer of them condemn than they did 30 years ago, even if a major of southern whites still oppose gay marriage. Culture DOES have an impact is my point-and not a trivial one. Even though, it is also itself caused by genetic variation. But if white southerners , en mass, got adopted at childhood by northerners, a lot of the particular values of the south, would disappear fast. No, not really. That’s the whole point of this post. The shared environment impact of these things is zero. Adoptees don’t turn out like they’re adoptive parents; they become like their biological parents. But isn’t it odd how some cultural norms can change so fast. Hey thanks for a reply. I think there is some difference in values, than there is in personality. I don’t think outcomes like IQ, or personality traits like aggressiveness, criminality , would change much if northerners adopted southerners in mass. I do think attitudes to religion (ie securalism ), homosexuality, etc would change fast. Values aren’t quite the same thing as personality traits, which is what shows 0 shared environment effect. Some things show huge shared environment effects, like what language you speak. Southern whites, on aggregate, adopted to northern whites , would still be more tribal on average than northern whites. But they would share a larger percentage (not arguing perfect overlap or convergence here) of values with there northern neighbors. No. The shared environment impact on those things is also zero. See the Hatemi study above or my post The Atheist Narrative. On the comments on White Southerners, the summary stats on the GSS actually show White Southerners of European background (I.e. all north central euro countries, combining anywhere from France, to Ireland, to Scandinavia to Poland) to actually outdo the same ethnic category from the Midwest, in education, vocab test and income. Its actually quite interesting and I’ll post the stats later when I am on my PC. Can’t trust ethnicity as reported in census/GSS. That’s why the methods described here were developed. Now, I had a feeling you’d try to dismiss it that way, but I’m talking about the aggregate of all Western European self reported ancestries together – Czech, Danish, English / Welsh, French, German, Irish, Dutch, Norwegian, Polish, Scottish, Swedish, Swiss. Certainly there is a lot of shuffling within that group – people of mostly German ancestry imagine they’re mostly of English ancestry, people of mostly English ancestry imagine that they’re Irish, etc. But statistically insignificant would be shuffling in and out of that group. Do you really believe there are masses of people misidentifying themselves within and outside the above groups, enough to have a statistically significant effect? Considering only Whites of North and Central European ancestry*, the whole South region generally does about the same as the Midwest, and better in some areas. Of course, the East South Central region is weak. 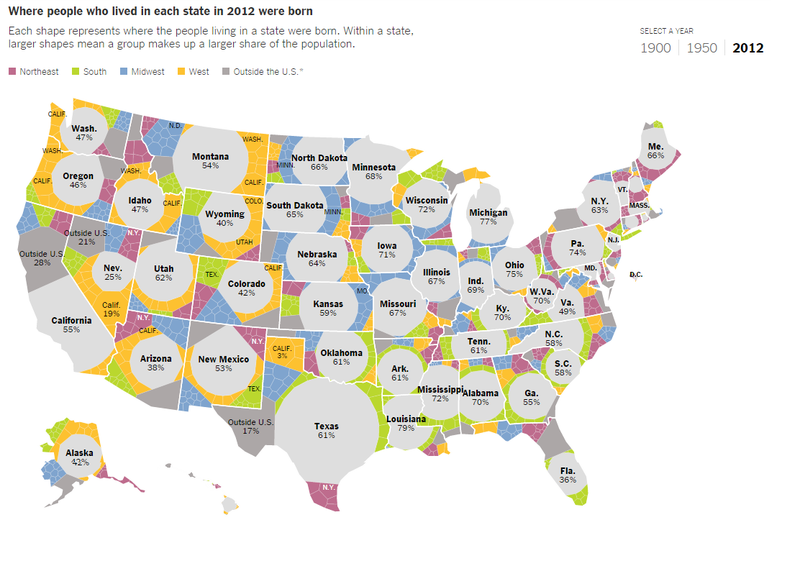 It’s also the least populous part of the South. The Northern plains are weaker in education, of course, compared to most of the South, for the same White North-Central European groups. I don’t hold high hopes for you being able to integrate much of this with your sense of reality, but that is how it is, nonetheless. *Those who aren’t are mostly, outside the Northeast, various White Hispanics and people with American Indian ancestry, who are more predominant in the South than the North, for obvious reasons. Here’s the problem: those who choose to self-identify a certain way may be (and often are) systematically different from those who identify another way. That’s what makes such analysis mostly useless. You’d need the methods employed here to get reliable answers. That said, I don’t find it implausible that outsiders to the South are smarter than the old stock inhabitants. The South never received large scale immigration, so what you could be seeing are transplants, who maybe smarter than average. The limitations remain in play, though. Has immigration really decreased by two-thirds within the last five years? I thought that too, but I think it’s actually a function of the graph measuring ten year periods (1999-2009) against a final four year period (2009-2013). Immigration proceeds apace! Curious that African American rises while the number of stories in the media about racism against A-A seems to rise during that time. That is, the larger the minority became, the more we heard about their ‘abuse.’ I’m not aware of a country outside the US where A-A are treated substantively better.